Humans are social animals and our network of friends and close relations are essential to most peoples sense of self-identity. Across cultures humans easily form groups and seek to define those groups as being separate and unique from "the other," whatever that other happens to be, whether it's religion, politics, lifestyle, or race. A common occurrence in humans (as well as other apes) is to pay attention to what prestigious members of our social group are doing and follow in turn. These shifting cultural patterns in groups that remain largely separate from one another seems to be the way that cultural evolution takes place. To show your allegiance to "the group" you perform your group identity through clothing, language, and your common interests. Over time two groups that might have had some overlap in the past become strongly divided, a process that continues to show itself most powerfully in the areas of race and class. It's not really racist, but I guess you could say that. 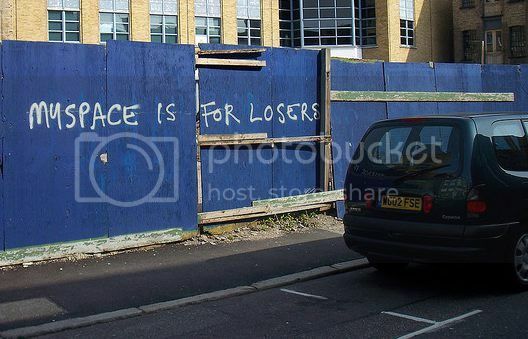 I'm not really into racism, but I think that MySpace now is more like ghetto or whatever. Launched in 2004, Myspace became the most popular social networking site in the United States by 2006 with an estimated 100 million accounts. Facebook was started the same year as Myspace but only those with a college affiliated e-mail address were able to join for the first several years. In 2006 Facebook became available for everyone and, as Boyd discovered through the course of her fieldwork with American teens, at the beginning of the year a common question was "Are you on Myspace?" but, by the end of the year, the question was "Myspace or Facebook?" Since most people joined social networking sites through their connections of friends, whichever their friends chose is usually the direction they went as well. The college-centered nature of Facebook quickly appealed to those teenagers who saw college, and thus Facebook access, as a rite of passage. They were aware of the site through older family members and friends who had already graduated high school and gone off to college. Before access became readily available, college-bound teens began coveting entrance. For many, access to the social world of college became a marker of status and maturity. Even those who had MySpace accounts relished the opportunity to gain access to the college-only Facebook as a rite of passage. What Boyd was witnessing among these teenagers was a similar scenario that has existed across the country wherever demographic shifts occur. In some neighborhoods this is referred to as white flight and in others it's called gentrification. White flight is most commonly known from the first half of the 20th century when blacks migrated from the South en masse to find work in the numerous factory jobs that existed in urban centers. Whites subsequently left in large numbers, and the jobs left soon after resulting in a ghettoization of the urban environment. Gentrification is the reverse trend and occurs when a largely minority neighborhood suddenly finds hipster coffee houses and condos buying out older commercial property, often resulting in an increase in rent and causing many long-time residents to move into outlying regions. Typically, MySpace users are more likely to be women, Hispanic or black, to have a high school education or some experience with college. . . Facebook users are more likely to be men and to have a college degree. Economic background of users on Myspace and Facebook. Data from estimates published by Quantcast as of April, 2010. But, as is often the case with any discussion of race, class is intimately intertwined due to the economic disparities that exist along racial lines in American society. According to the statistical estimates at Quantcast, Facebook users today are largely wealthy and college educated (62% of users make more than sixty thousand dollars a year and 53% have completed either college or grad school). In contrast, 54% of Myspace users are in the upper income bracket but only 41% have attended college. 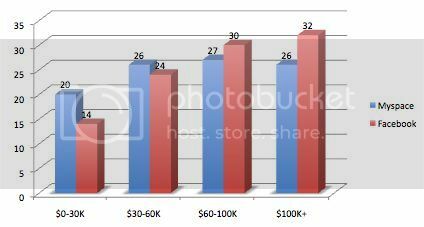 However, while an 8-12% difference may not seem like much, what is most telling is that those in the lowest income bracket are significantly "overindexed" on Myspace and are 36% more likely to be found there than on Facebook. 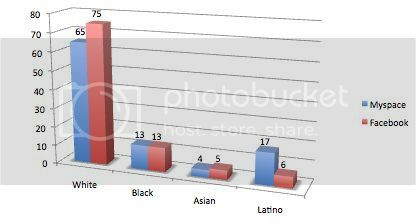 Ethnicity of users on Myspace and Facebook. The greatest disparity in use between the two networks appears to be with whites and latinos. Whites make up 75% of the traffic on Facebook but 65% on Myspace while latinos make up only 6% of the Facebook traffic and 17% of the traffic on Myspace. In contrast, blacks and Asians have about the same presence on both networks. Last year Boyd looked at some of these demographics as well and placed her "white flight" argument into context. In all cases these statistics should be treated skeptically since gathering this data is difficult at best. To some, bling and flashy MySpace profiles are beautiful and creative; to others, these styles are garish. While style preference is not inherently about race and class, the specific styles referenced have racial overtones and socio-economic implications. In essence, although teens are talking about style, they are functionally navigating race and class. Given Boyd's research and the statistical trends nationwide, it would appear that a virtual demographic shift is indeed taking place. In much the same way that high school students feel pressure to adapt to their network of friends based on the social values of their group, so do our network of virtual "friends" pressure us in the same way. The higher castes of high school moved to Facebook. It was more cultured, and less cheesy. The lower class usually were content to stick to MySpace. Any high school student who has a Facebook will tell you that MySpace users are more likely to be barely educated and obnoxious. I shifted with the rest of my school to Facebook and it became the place where the 'honors kids' got together and discussed how they were procrastinating over their next AP English essay. In the wake of many teens departure Boyd describes what was left behind as the formation of a digital ghetto. Abandoned Myspace profiles "often fell into disrepair, covered in spam, a form of digital graffiti [as] spammers took over like street gangs." In contrast, Facebook was seen as a virtual gated community with the "same values signaled by the suburbs." The class bias represented in this was extremely telling in 2009 when Facebook and Myspace converged with roughly equal numbers of visitors. A New York Times story about this convergence was titled "Do You Know Anyone Still on Myspace?" This confession by the author is extremely revealing. Given data showing equal traffic his preference was to make assumptions based on his network of friends, a trend that is likely to be pervasive throughout the mainstream media on stories that are much more important. Today, Myspace trails behind in the social networking battle with 22.8 million hits per week (it's lowest number yet) compared to Facebook's 78.2 million (it's highest number yet). As the divergence continues the amount of investment that Rupert Murdoch's News Corp. (which owns Myspace) will put into the network is likely to diminish. Tech support will become harder to access, the ability to flag those who are engaged in abusive conduct will wane, and more people will abandon their profiles. How much of this shift is due to the factors of race and class and how much is due to a better platform to engage with friends is hard to say. But the fact that such a disparity exists (and appears to be growing) is extremely telling. My own Myspace profile has been laying dormant for some time now. I think it's time I head back, clean up some of the digital graffiti, and make a fresh start. "To some, bling and flashy MySpace profiles are beautiful and creative; to others, these styles are garish. While style preference is not inherently about race and class, the specific styles referenced have racial overtones and socio-economic implications. In essence, although teens are talking about style, they are functionally navigating race and class." Why no distinction between race and ethnicity. I know that the two are correlated, but it seems like an important distinction to me. These issues are more about culture than genetics. "Teens joined social network sites to be with their friends. Given social divisions in both friendship patterns and social spaces, it is unsurprising that online communities reflect everyday social divisions (16)." There is a quote in Boyd's paper where a teen notes that a certain clique were on FB because they always have to have the newest thing. These issues include discussions of race and ethnicity, but are cultural at their core. I agree with Krystal's perspective. I think this is primarily an issue of culture rather than genetics. Given that African-Americans are equally represented on both social networking sites (and have been for many years) it seems what Boyd's informants were responding to was "ghetto" culture rather than race per se. As Ricketson points out, race and ethnicity are highly correlated, but white respondents didn't seem to have a problem with the number of black Facebook users, just the black Myspace users. When the demographics are understood as primarily a class division this nuance becomes more clear. The black Myspace users who came from a poor background and with little formal education were viewed as having a culture associated with "bling" and with being "poorly educated and obnoxious." But no one seemed to have a problem with the wealthier and more highly educated black Facebook users. This makes the issue less about race in the biological sense and more about the culture of poverty within a specific racial or ethnic group. i am a little perturbed about how the word "race" is thrown around in this post, though. the majority of anthropologists, both biological and cultural, have reached a consensus: there is no biologically valid concept of race. it doesn't exist. humans vary, but the variation is not patterned into discrete groups. there is more variation within one of these culturally constructed group than between groups. this notion is particularly obvious in the US, where considerably admixture has occurred in the past 500 years. thus, the groupings in this study are purely constructed and have no genetic basis. i bring this up as a point of caution. Even though the researcher and the blogger think this myspace/facebook phenomenon is cultural (and I'm sure it is), they still toss around the possibility of race and genetics - these options should not even be on the table. Where is any mention of genetics? From a biological standpoint, yes, it's true that race doesn't exist. However, from a sociological perspective - which is what is relevant to this article - it most certainly does exist. People in our culture divide people into races, perceiving individuals as "white", "black", "Asian", "Latino", etc.